Ford has today initiated its electric vehicles plan for Europe, with the debut of its Transit Connect Electric at the 2010 IAA Commercial Vehicle Show in Hannover, Germany. Ford plans to introduce, for European customers, five full electric or hybrid vehicles across its light commercial vehicle, C and CD and ranges, by 2013. The Transit Connect Electric is the first of these five vehicles to be introduced in Europe. A zero-emission, pure electric-powered version of the award-winning Transit Connect light commercial vehicle, it will go on sale in North America later this year and is due to become available in Europe during 2011. The Electric derivative is based on a long wheelbase version of the successful Transit Connect, which was launched in 2003 in Europe and was introduced to the US in 2010. 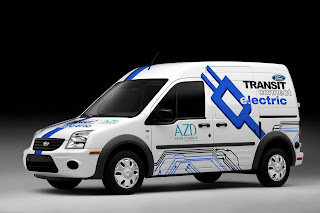 Transit Connect Electric builds on Ford's relationship with its electric vehicles partner, Azure Dynamics, as well as their shared experience with battery supplier, Johnson Controls-Saft. "We recognize an increasing interest in electrified vehicles and have an aggressive strategy to bring these vehicles to the marketplace," said Nancy Gioia, Ford director of Global Electrification. "Our work with Azure to create a pure electric battery Transit Connect vehicle will allow us to offer our commercial customers an additional option for environmentally advanced transportation." * One further HEV vehicle to be confirmed for 2013. Ford's relationship with Azure Dynamics is already well established in North America and is now being extending to Europe. In North America, Azure develops hybrid electric and electric drive technology, as the Balance™ Hybrid Electric, for shuttle buses and commercial trucks built on a Ford E-450 'cutaway and strip' chassis for the medium duty commercial vehicle segment. Michigan-based Azure began work on its collaborative agreement to deliver the pure battery-electric powertrain for the Transit Connect in the U.S and Canada in October 2009. The extension of this collaboration into Europe is a logical next step. "The European Union and individual governments are keen to encourage adoption of electric transportation technology because they understand the potential benefits to energy infrastructure and to society at large," Harrison added. "We believe that European commercial vehicle customers will be eager to adopt the Transit Connect Electric into their fleets, to reduce vehicle emissions and demonstrate their commitment to becoming part of the solution." Azure Dynamics will integrate its proprietary Force Drive™ battery electric drive train into the Transit Connect Electric, which will have a targeted range of 130 km or 80 miles minimum on a full charge and zero tailpipe emissions. Force Drive™ components have previously been deployed in more than 40 vehicle integrations and have more than 25 million miles of on-the-road experience. Transit Connect Electric will offer fleet owners the opportunity to eliminate the use of petrol and help to lower operating costs. The vehicle will be badged with both the Ford Blue Oval and Azure's Force Drive logo. Azure Dynamics has selected Johnson Controls-Saft to supply lithium-ion battery cells and battery packs for the Transit Connect Electric. Azure Dynamics and Ford both currently utilize Johnson Controls-Saft battery technology for other products. Transit Connect Electric will utilise the same proven cell technology currently deployed in the Ford Escape plug-in hybrid fleet that is already on the roads of North America. The Ford Transit Connect has achieved significant success since its launch in 2003, and was introduced to the North American market in 2010. With a unique combination of car-like driving dynamics, cargo capacity, accessibility and low purchase and operation costs, it is an ideal choice for electrification. Commercial vehicle operators often travel predictable, short-range routes with frequent stop and go driving in urban and suburban environments. For customers seeking sustainable mobility solutions, the Transit Connect Battery Electric Vehicle with Azure Force Drive™ will provide a zero emissions option. The Transit Connect was designed, engineered and manufactured on a dedicated global commercial vehicle platform to beat tough commercial vehicle durability standards. A final manufacturing location for the Transit Connect Electric is yet to be determined. Ford's Product Development team is participating in two specific European trial initiatives to demonstrate the technology in real world driving conditions, and generate feedback to help develop further the Focus Electric and the Transit Connect Electric for market acceptance in Europe. In the UK, Ford is working with Scottish and Southern Energy (SSE), the London Borough of Hillingdon, and the University of Strathclyde on the UK's Ultra Low Carbon Vehicle Fleet Demonstration with a fleet of 21 prototype electric vehicles to collect data on their performance with a mixture of fleet and private users. In Germany, Ford is working with RheinEnergie AG, the city of Cologne and the University of Duisburg-Essen on the ColognE-mobil program, using a fleet of 25 electric vehicles to conduct road testing. This program is part of a much larger research effort in several cities in Germany involving multiple automakers, utility companies, universities and technology partners. "These initiatives are a revolution for both the utility and automotive industries," Stephen Odell, chairman and CEO, Ford of Europe said. "Collaborating across sectors is essential to ensure customer focused products that provide the right value along with the readiness of the infrastructure. We need to work and learn together and Ford is very pleased to be a part of these important trials." Ford Motor Company is committed to offering customers affordable environmental technologies in the vehicles they want and value. "Ford is focused on solutions that reach not just hundreds or thousands of cars, but millions of vehicles – because that is how Ford can truly make a difference," Derrick Kuzak Ford's group vice president of Global Product Development said. A key element of this approach is Ford's ECOnetic Technologies program, launched earlier in 2010. It is a customer-driven initiative bringing together a range of vehicle features and technologies specifically targeting better fuel economy, reduced emissions and overall lower cost of ownership, without compromising safety, driveability or performance. This includes the new Ford EcoBoost global engine family featuring turbocharging and direct injection technology, Ford's ECOnetic range of low- CO2 technologies in Europe, and multi-speed transmissions such as Ford PowerShift. In addition, Ford is developing and introducing a range of other environmentally focused features, including advanced electric power steering, weight reduction and aerodynamic improvements, plus biofuel-capable vehicles, hybrids and plug-in hybrids. "Electrification is a key element in the effective use of Ford's global resources and talents to provide a portfolio of affordable and fuel-efficient technologies for customers," said Odell. "In particular our fleet trials in the UK and Germany will give us vital experience and insight into how fleet and private customers for these niche models will use them on a daily basis. This will ensure that the five models we bring to market are fully developed to meet their expectations." Note: This data information in this press release reflects preliminary specifications and was correct at the time of going to print. However, Ford policy is one of continuous product development. The right is reserved to change these details at any time.